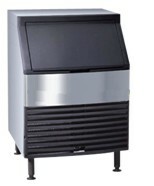 Our ice flaker machines are conceptualized and designed to meet the challenging to all the microbiology, biochemistry, biotechnology and genetic engineering laboratories that have a continuous requirement of ice to store their biological samples along with transportation to other facilities. We strongly believe in the principle of quality first and everything else to follow, which reflects in our products, which are renowned for long trouble free services in various research and educational institutes across India and abroad. Our ice flaker machines are made of corrosion free metal components with advance poly urethane insulation ensuring maximum thermal efficiency and durability. We specialize in both standard and customized models of ice flaker machines specially designed to meet various special requirements of our customers across India and abroad..
1. Corrosion free exterior and interior. 2. Designed for continuous production of ice throughout the day. 3. Environmental friendly CFC free cooling. 4. Micro processor based temperature control. 1. Maximum Production : 70-80 kg / Day (During 24 hour operation). 2. Quality compressor & Air Cooled condensation CFC/HCFC Free. (R134a). 3. Storage Capacity of bin : 15 kg. 4. Type of ice : flakes/Grains. 5. Interior and exterior are made of corrosion resistant material. 8. Automatic low water cut off system. 9. Automatic full storage cut off system. 10. Provided with geared motor with overheating and over voltage protection. 11. Production start time : 10-15 mins. 12. Provided with castor wheels for easy movement.